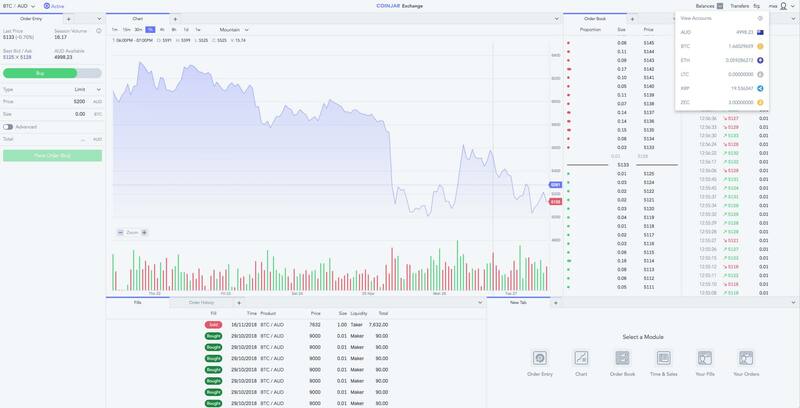 CoinJar Exchange is an advanced digital currency exchange that supports high-frequency, low-latency execution for experienced traders. CoinJar Exchange is built to execute trades with speed and agility, faster than any other digital currency exchange in Australia. 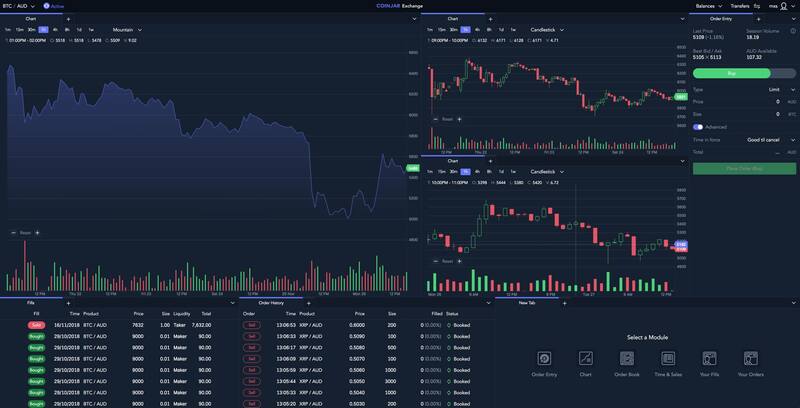 Trade BTC, ETH, LTC, ZEC, XRP with market depth and price charts, multiple daily auction windows and time-enforced order types - all on CoinJar Exchange’s clean and customisable interface. 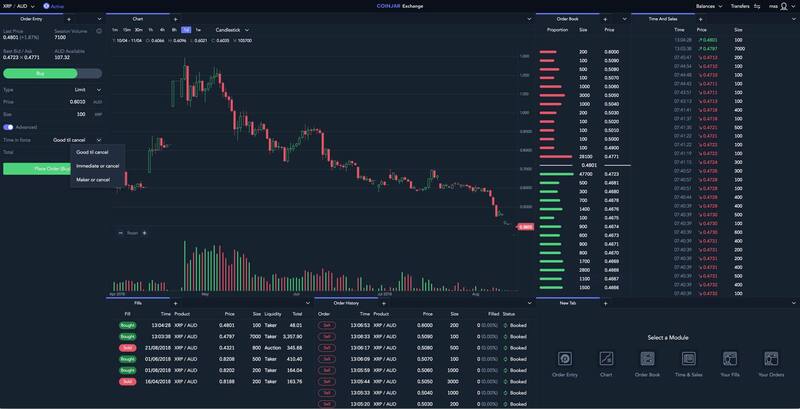 Powerful data features include live orderbook, market depth and price charts. Customise the layout using grouped tabs, split windows and column ordering. BTC/AUD, ETH/AUD, XRP/AUD, LTC/AUD, ZEC/AUD, ETH/BTC, XRP/BTC, ZEC/BTC and LTC/BTC. Take advantage of the three daily auction windows to get a fairer price and better opportunities. Utilise time enforced order types with ‘Good til Cancel’, ‘Immediate or Cancel’ or ‘Maker or Cancel’ trades. Fully extensible access to the CoinJar Exchange API, with comprehensive documentation. There are no maker/auction fees on CoinJar Exchange. For taker fees when trading AUD pairs, the fee schedule is dynamic and determined by your 30-day trading volume. For BTC pairs, the fees are fixed. This comparison data is correct as of 21 November 2018, and does not represent or imply any endorsement, recommendation, affiliation or opinion towards any of the competing services mentioned. We employ multiple strategies to protect our customer's assets and information, including data encryption, Transport Layer Security, periodic security audits, organisation security and enhanced security features for users. CoinJar is backed by top investors in Australia. We’re also registered with the Australian Transaction Reports and Analysis Centre. 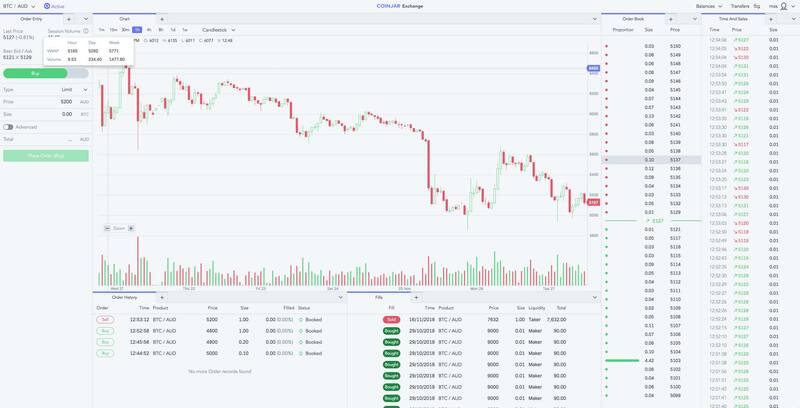 What cryptocurrency trading pairs are available on CoinJar Exchange? Is CoinJar Exchange free to join? How do I transfer funds into my CoinJar Exchange account to begin trading? Where can I find more information about CoinJar Exchange? How do we calculate the 30-day volume? What are taker, maker and auction trades? Curious to know more about CoinJar Exchange? Check out CoinJar Support for more help articles and documentation to learn more about trading and our platform.